Bottleshower™ 'TAP' Head (-) Pack – Freeflush Rainwater Harvesting Ltd. 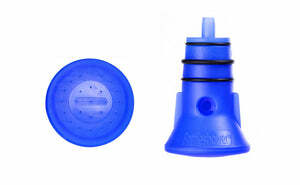 The ‘TAP’ head increases the flow time of a 1litre bottle of water by 10 times giving 2 minutes of washing time. A 350mm tube is also supplied in the pack to ensure perfect flow from full should you want to use larger 1.5 to 2litre bottles. The tubes can be easily changed to suit your needs.